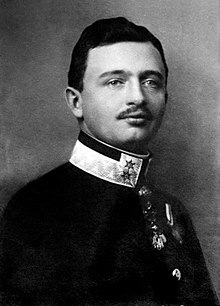 Charles I or Karl I (Karl Franz Joseph Ludwig Hubert Georg Otto Maria; 17 August 1887 – 1 April 1922) was the last Emperor of Austria, the last King of Hungary (as Charles IV, Hungarian: IV. Károly), the last King of Bohemia (as Charles III, Czech: Karel III. 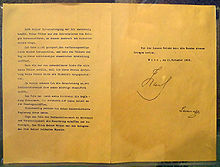 ), and the last monarch belonging to the House of Habsburg-Lorraine before the dissolution of Austria-Hungary. After his uncle Archduke Franz Ferdinand of Austria was assassinated in 1914, Charles became heir presumptive of Emperor Franz Joseph. Charles I reigned from 21 November 1916 until 11–12 November 1918, when he "renounced participation" in state affairs, but did not abdicate. He spent the remaining years of his life attempting to restore the monarchy until his death in 1922. Beatified by Pope John Paul II in 2004, he is known to the Catholic Church as Blessed Karl of Austria. Pribram, Alfred Francis (1922). "Charles" . In Chisholm, Hugh. Encyclopædia Britannica (12th ed.). London & New York.